Our Adventure Hikes replace the standard 1 hour dog walk. It will be the best part of your dogs day. 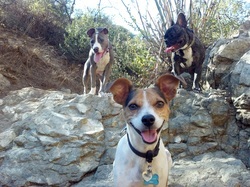 Our hikes include structured exercise, playtime and training. Your furry best friend will get the exercise, mental stimulation and socialization it craves. We have doggy friends we take from 1-5 days per week. We will train your dog to be off leash and social with all dogs. Watch the Videos below to get a sense of what the Adventure Hikes are like for your dogs. Worried your dog is too small, too big, scared, not socialized, not trained, or not fit enough? Please put your worries aside as we take pride in, and love working with any and all types of dogs to get over any issues they have.